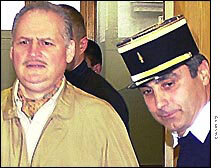 Convicted terrorist and murderer Carlos Ilyich Ramirez Sanchez, also known as "Carlos the Jackal," is still upset about how he is portrayed in the new movie, "Carlos," which premiered at Cannes in May. Ramirez is fuming about the movie from a French jail, where he has been since he was finally arrested in 1994. Ramirez sent a message from his cell last week complaining that the movie is "blackening his name," which you might have thought was pretty black already. The message was carried by Ramirez's lawyer, Isabelle Coutant-Peyre, who also happens to be Mrs. Jackal. (It appears that one hyphen is enough for her, although I like to think that when she signs formal court documents she uses the full "Isabelle Coutant-Peyre-Ilyich-Ramirez-Sanchez-Jackal.") Coutant-Peyre fell in love with the greying paunchy Venezuelan (that's how the report describes him) at some point while representing him, and after a long and hopefully utterly terrible courtship, the two creeps were finally allowed to marry. She is carrying out his attack on the film, and has filed one lawsuit and has threatened more if the movie is widely released. The greying paunchy Venezuelan says the film contains "historical inaccuracies" and outright lies, and here are a couple of the things he is upset about. First, he is apparently unhappy about a description of a 1975 incident in which he and some pals took 70 people hostage at an OPEC meeting, killing three of them, an attack the movie says was ordered by Saddam Hussein. "I'm scandalized," Ramirez said about the inaccuracies. "It's shameful." He says he was actually working for Moammar Qadafi. Second, he complains that the movie shows him and his comrades as "hysterical men waving machine guns and threatening people," which he said was completely ridiculous, because they never got hysterical. "Things didn't happen like that," he insisted. "These were professionals, commandos of a very high standard." Ironically, maybe the Jackals should not be so worried about the movie, because at least some reviews have complained that it actually tends to glamorize Ramirez, or at least perpetuate myths about him "in subtle and insidious ways." It is not likely to perpetuate them very far, however, because the movie is five-and-a-half hours long, which is almost exactly five-and-a-half hours more than most people care to spend hearing about Carlos the Ex-Jackal. On a humorous note, Ramirez, who is now 60, will die in prison.